Photo: Captain Jacob Shoemaker House, ca. 1810, Legislative Route 45012, Middle Smithfield Township, Monroe County, PA. Listed on the National Register of Historic Places in 1979. Photographer not listed, undated, [cc0-by-1.0 (creativecommons.org/publicdomain/zero/1.0/deed.en], via Wikimedia Commons, (National Park Service, http://www.hscl.cr.nps.gov) accessed October, 2014. Monroe County Courthouse is located at 1 Quaker Plaza, Stroudsburg PA 18360; phone: 570-420-3450. Monroe County is situated midway in the tier of counties which border along the Delaware River on the eastern boundary of Pennsylvania. Pike and Wayne counties form its northern limits while in the south the Blue mountain separates Northampton from Monroe County. The Delaware River provides a natural boundary in the east and Carbon and Luzerne counties are its western neighbors. Originally the area comprising Monroe County was part of Bucks County but later constituted a section of Smithfield township of Northampton County. The erection of Pike County in 1814 divided the area now included in Monroe County between Northampton and Pike counties. By an act of the General Assembly on April 1, 1836, the section north of the Blue mountain finally was made into a separate civil unit. For some time the inhabitants had been petitioning the legislature to call the new county either Fulton or Evergreen. The death of ex-President James Monroe in 1831 influenced the decision and the new county was named Monroe. When Carbon County was erected in 1843, Penn Forest township, in the western part of Monroe County, was added to the new county. This change reduced the area of Monroe County to 611 square miles within its present boundaries. Monroe County was one of the earliest sections of Pennsylvania to be occupied by white settlers. The Dutch expanded their interests in the New York area by building a road from Esopus (Kingston) to the copper mines on the New Jersey side of the Delaware River above Shawnee. Over this "Old Mine Road" came the early settlers to make their homes on lands purchased from the Delaware Indians. Both Nicholas DePuy and Daniel Brodhead were established in the area by 1727. There is some evidence that the De Puy settlement at Shawnee preceded the Brodhead venture in the East Stroudsburg section by two years. Dunnaway records the first permanent Dutch settlement in Pennsylvania along the Delaware in 1659. Other authors claim the Shawnee settlements were established before the arrival of the Swedes in Chester County. The evidence is largely based on the assumption that the Dutch copper mines in New Jersey could not have been operated without settlers established on the Pennsylvania side of the river. Regardless of the merits of the discussion, settlers were living in the section now included in Monroe County long before the arrival of William Penn. The early settlers, located on the flats adjacent to the Delaware river, were fortunate in having chosen the best land in the area. Almost the entire northern two-thirds of Monroe County lies in the Pocono plateau, a rugged, unfertile tract not well adapted to agriculture. Below the Pocono mountain ranges are fertile valleys which in sections are divided by low hills running from east to west. 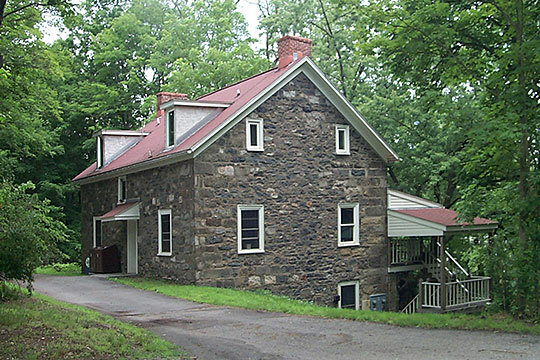 Godfrey's ridge divides the broad valley in which Stroudsburg is located from the narrow, charming Cherry valley. The Ridge terminates near Brodheadsville and both valleys converge to form the large, beautiful Pleasant valley in the western section of the county. The streams of the southeastern section of Monroe County, the Big Bushkill, Marshalls, Brodheads, Pocono, McMichaels and Cherry creeks, flow east into the Delaware river. The Pohopoko, Wier, Frantz and Aquashicola creeks flow westward towards the Lehigh river. The streams in the remote end of the Pocono plateau, the Tobyhanna and Tunkhannock, also turn west to the Lehigh river. Nature has given Monroe County an excellent drainage system with her streams rising in the Pocono plateau and flowing through the valleys to join the Lehigh and Delaware rivers. The rugged mountain areas of the county have proved disappointing to those in search of mineral deposits. Since the rock formations in Monroe County are below those of the coal bearing strata, no coal deposits have been discovered as in neighboring counties. Deposits of iron ore have been located but have not been utilized extensively on a commercial scale. Slate gravel, from Godfrey's ridge and the Milford road, have been used for road building material. The limestone quarries near Bossardsville have yielded a light, gray lime which is excellent for agricultural and building purposes. Glass was manufactured from the sand and pottery and bricks from the clay in the Saylorsburg section. About 1858, slate was discovered near Kresgeville and used for making slates for school children. Early settlers soon discovered that the natural wealth of the region consisted of the extensive forests of the Pocono plateau and the fertile soil of the lower valleys. Lumbering and agriculture flourished in the period before the Civil War. The settlers have drifted into Monroe County largely from three sources. The early migration from New York over the "Old Mine Road" has already been mentioned. These pioneers were soon joined by another group who arrived in Philadelphia and moved north through Bucks and Northampton counties beyond the Blue mountains. The western townships of the county received a heavy Pennsylvania German migration from the "dry lands" of Northampton County. These settlers could not resist the lure of the fertile farm land in the "Pleasant valley" and left their undesirable location to develop the "West-end" of Monroe County.